Prevent scar overgrowth after injury or surgery. Shrink Old scars. 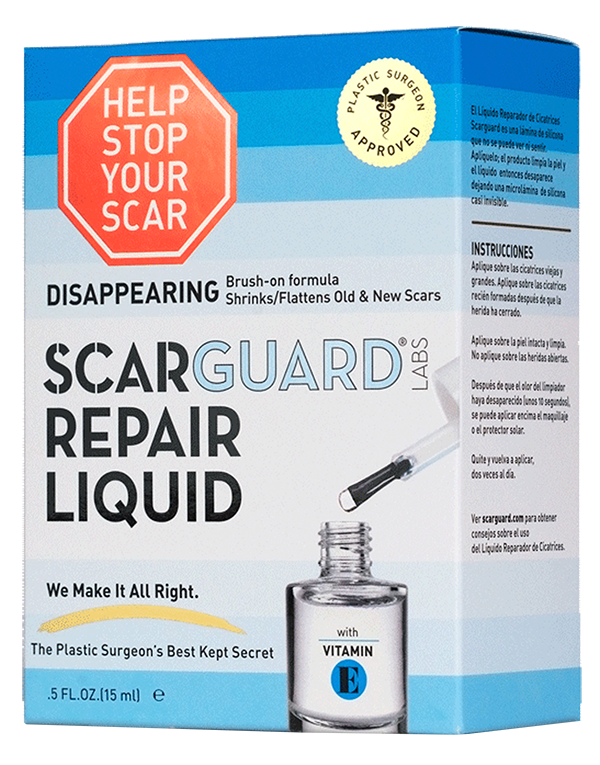 The #1 scar product recommended by plastic surgeons worldwide. Many scar products on the market today do not work. If you look at the ingredients, you might be shocked to see they are onion creams or oils with no science behind them at all! So how do you find something that actually works? 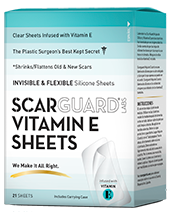 Scarguard was invented by a plastic surgeon for plastic surgeons to control scarring after surgery. 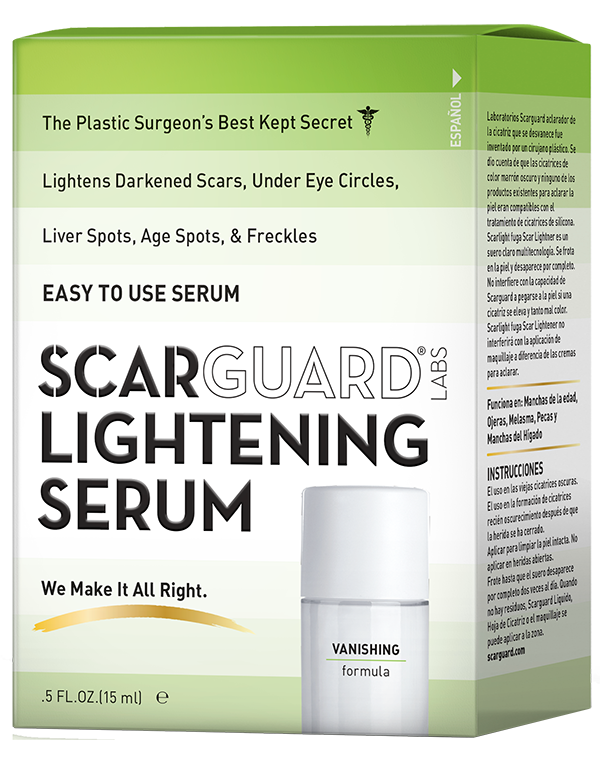 After extensive review, it was bought by the Mentor® division of Johnson & Johnson for distribution to plastic surgeons and dermatologists. 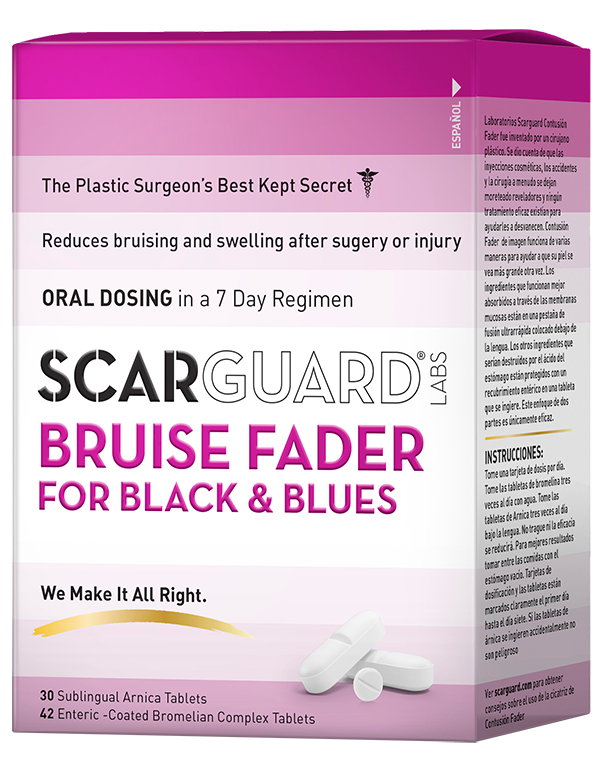 It quickly became the #1 product dispensed by plastic surgeons for scars* and gained high acclaim in the medical literature as effective to reduce scar formation after surgery or injury and to reduce old overgrown scars. 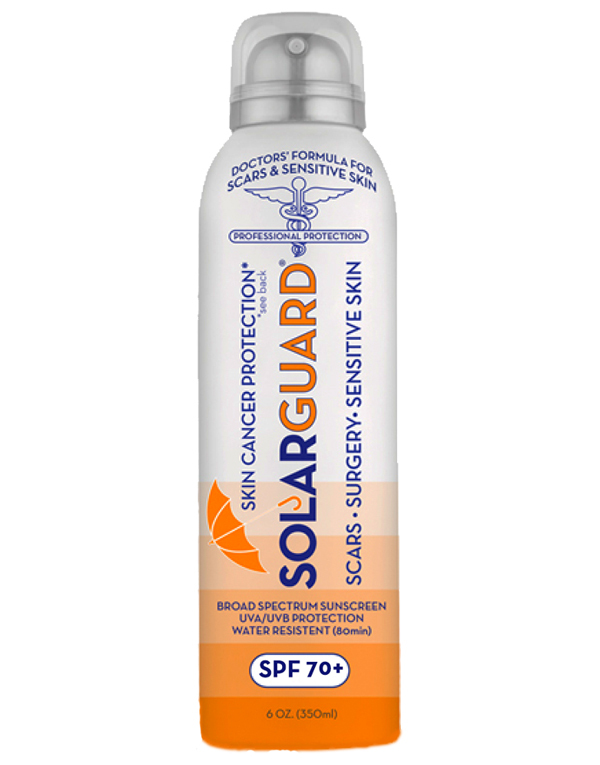 Order Scarguard by clicking here or read below if you want to see how it works. Scars explained by a Board-Certified Plastic Surgeon. Collagen is Mother Nature’s cement, used to repair the skin. Overgrown scars are simply too much of a good thing. Mother Nature gave our skin fibroblast cells, a natural emergency repair crew. 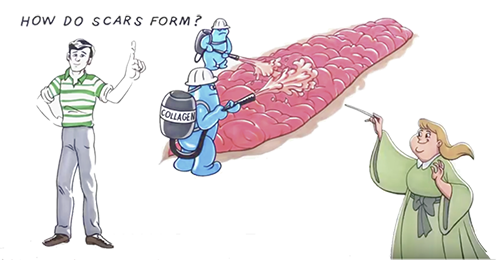 Fortunately, Mother Nature also gave our cells the ability to make collagenase, a powerful scar melting enzyme. This is how the skin tries to repair itself. Scar management can only be successful if it helps tilt this process in our favor. How does that work? Tilt this balance and win the Scar War. Some of these things follow simple common sense. 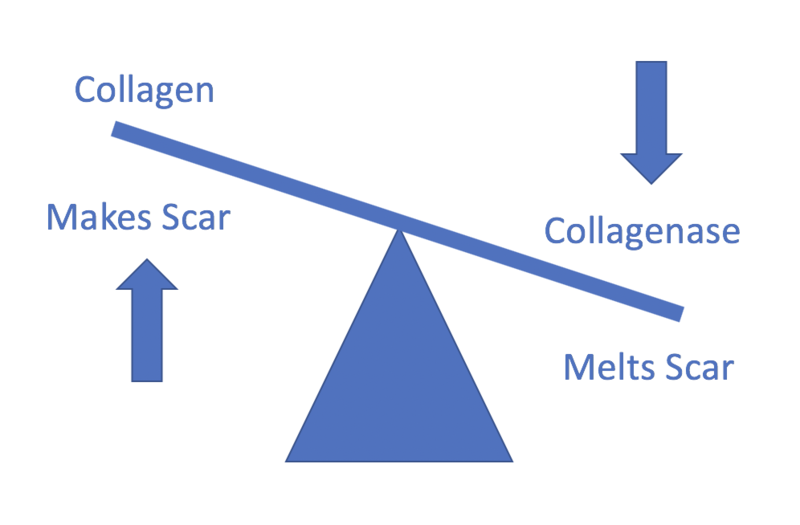 If a scar is forming over a joint, our cells make more collagenase to melt it and protect the motion. Tension can be created by stretching the skin around the joint or pressing on it. Either way, collagenase is stimulated. Topical silicone pads create surface tension, awakening this process, even on skin that is not over a joint. Vitamin E has been shown to enhance this process when added to silicone. A cortisone shot directly into the scar is the doctors most powerful tool to tilt this balance. It raises collagenase tremendously. But this hurts and is scary, so it is only used in severe cases. So things that have been shown to melt scar tissue are tension, silicone, Vitamin E and cortisone. But wraps and pads are ugly and shots hurt. Scarguard has overcome these problems. Scarguard solves these problems while delivering all of these treatments. This clear liquid brushes on. For a few seconds it smells like the doctor’s office as it cleans the skin. The cleanser part very quickly dissolves, leaving no smell at all. What remains is a nearly invisible silicone Nanopatch®, the thickness of a single skin cell! This microscopic pad delivers silicone, Vitamin E and cortisone. Independent clinical studies have clearly shown it to tilt this balance tremendously in our favor. Independent studies have shown that treating scars over the first three months after an injury will result in much less visible scarring. 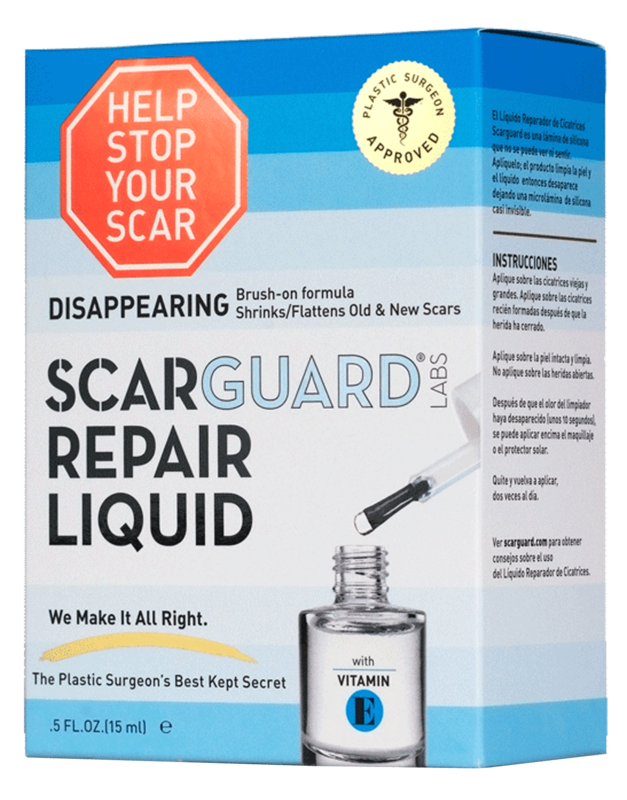 Also, if an old scar is thick and raised, using Scarguard will flatten it. Please read the ingredients of scar treatment you think of using. Many are onion juice cream! Independent studies have not shown them to be very effective. Silicone pads work, but are ugly. Silicone creams do not create the tension described above. Several scar products on the market have no science at all! Remember, claims to improve appearance are not medically regulated. Makeup improves appearance. You will not see a real drug facts panel on most of these scar products with approved scar treatment claims. Scarguard is clinically proven, independently studied, and works. 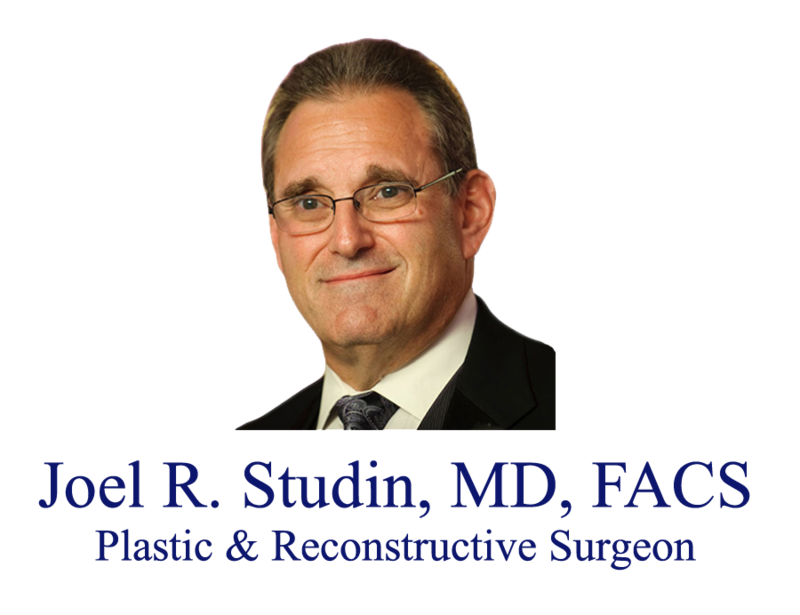 *Mentor Corporation review of scar treatment choices by plastic surgeons.